We are here. In the city I love. Actually, we’re on the outskirts of Paris, staying in my brother-in-law’s apartment in a town called Nogent-sur-Marne. 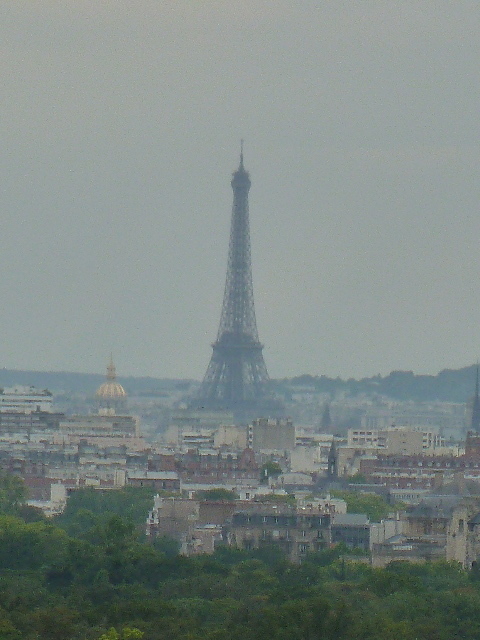 The apartment is located in a highrise and their balcony offers a terrific view of Paris. It’s hazy today, but here’s a photo of the city’s most famous monument taken from our digs. 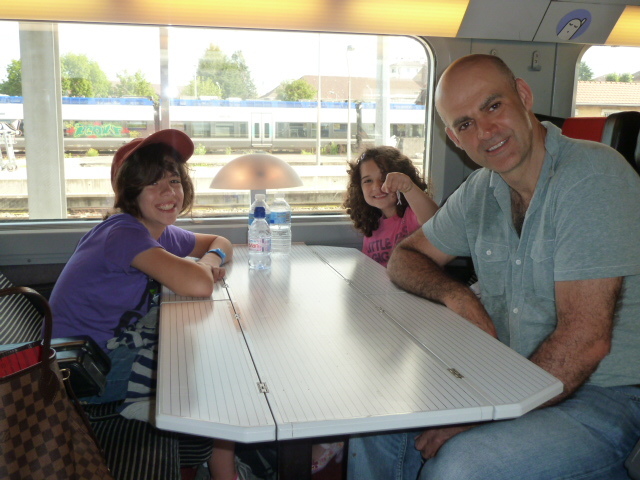 The train from Annecy to Paris was uneventful, although the girls thought it was cool that you could buy food on the train and that the table between our seats was foldable. I’m telling you – it’s truly amazing what kids find amusing and exciting. 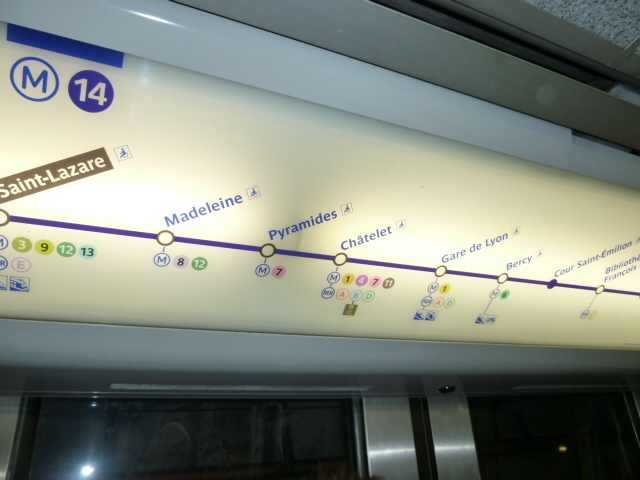 Once we arrived in the capital and unpacked, we took the subway to Bercy Village at the Cour Saint-Emilion in the 12th arrondissement. It’s amazing how this area of Paris has changed since we lived nearby in the 1990s. 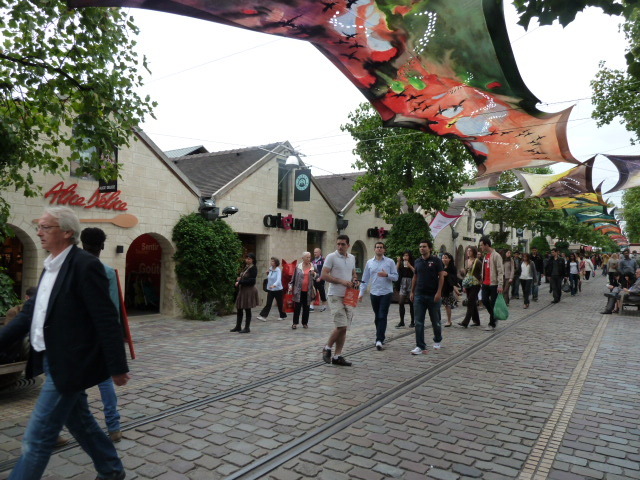 The village had fallen into disrepair by the mid-20th century, after serving as the largest wine and alcohol market in the world in the 19th century. When the architects restored the site, they made a concerted effort to retain the character of the place. It’s an absolutely charming spot, a little oasis in the middle of a bustling European city. Lots of cafes, interesting stores and a huge movie theater. Sadly, however, the cinema now sells goodies at a counter in the lobby just like in the States, instead of the charming way they used to do it (which wasn’t so long ago) – sending an employee into the theater carrying a huge bin of treats to sell to the guests already in their seats. That’s a bummer. In any case, the girls got their very quick introduction to a non-touristy part of Paris. Non-touristy is the theme of the Paris portion of the trip. Off the beaten track or “insolite” as they say in French. Our adventure will truly begin on Monday because tomorrow is a family day -we’re visiting an uncle and cousin who live near Fontainebleau and they are preparing lunch for us, which I know will be copious, yummy and very, very French!